The overall goal of the Maritime Transport Cluster was building a structure for exchange on the latest knowledge and experiences concerning maritime transport in the context of the Interreg IVB North Sea Region Programme, aiming to develop the common voice of the programme on maritime transport. In the end, the MTC Policy Paper was composed based on experiences gained in the North Sea Region, which should contribute to discussions on future transport policy developments in Europe. To establish an MTC network covering all North Sea Region Programme transport projects as a platform for discussions and exchange. To identify synergies between the North Sea Region Programme project results and to consolidate these into overall programme outcomes on transport. To match the programme outcomes and discuss these with the business community. To match programme outcomes and business trends, also taking into account the latest R&D, and connect them to policy development. To compose a policy advice based on the North Sea Region Programme experiences to contribute input to help focusing on future transport and cohesion policy programmes. To convince the relevant decision-makers at the national level and EU institutions to make use of the MTC policy advice. 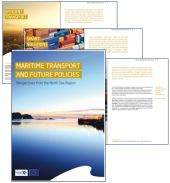 MTC applied the cluster idea to the maritime transport sector, thus creating a bridge between the results from the on-going Interreg projects dealing with maritime transport issues (priority 3 and partly priority 2) and new business trends in the maritime industry as well as with EU transport policy development. This meant it raised awareness about the results being achieved in individual projects and ensured that these results were known and used as widely as possible in the North Sea Region. Joint forces for the benefit of the Baltic Sea- and North Sea Region; Co-operation of the transport clusters!